The world’s largest International Folk Art Market is making its return to Arlington for the second year on Thursday, June 14 through Saturday, June 16, bringing with it global folk art, international cuisine, live entertainment, family friendly activities, VIP events, and more. Not only will you experience the best of the best of global folk art right here in your own backyard, your attendance and purchases will impact thousands of lives worldwide! You’ll experience world-class global folk art that you can’t find anywhere else in Texas. There’s a reason why USA Today ranked the International Folk Art Market (Santa Fe) as “#1 Best Art Festival In America.” 41 global folk artists from 30 countries will be represented at the Market, and over a dozen different mediums will be exhibited, including jewelry, beadwork, basketry, carvings, ceramics, glasswork, metalwork, paintings, mixed media, sculpture, textiles, musical instruments and home goods. No other event, gallery or museum in Texas offers the quality and authenticity of the folk art that will be exhibited, all in one place. You’ll be making an impact. The International Folk Art Market Arlington is much bigger than the art itself, because of its dramatic economic impact on the home communities of the artists. More than 40 artists will be trekking to Arlington from nearly 30 countries such as Colombia, Haiti, Ukraine, Italy, Chile and India, after applying for visas and making international shipping and travel arrangements. These exhibiting artists typically earn around $3 per day in their home country. 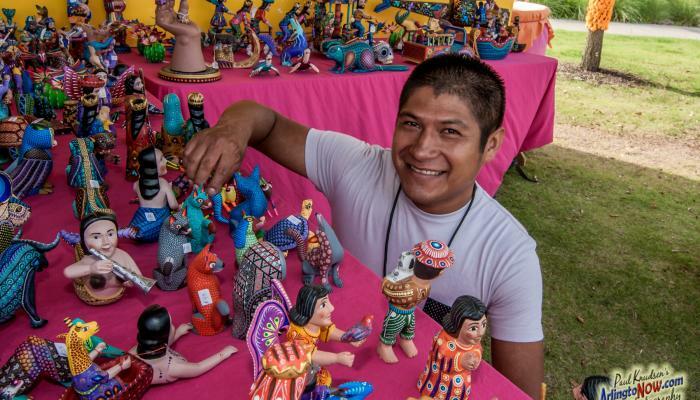 As a result of their participation in the International Folk Art Market Arlington, each artist will take home an average of nearly $10,000, providing as much as five (5) years of income and affording them the vital resources needed for their families and communities. Artists have even reported being able to build much-needed infrastructure, including wells, bridges, and even schools, as a result. Bottom line – your attendance and purchases will impact thousands of lives who REALLY need it. On Saturday (June 16), from 8 a.m. – 2 p.m., kids and their families are invited to participate in the “Children’s Passport Project.” Participants will receive a special Market passport to explore around the world, “visit” a list of countries/artists, and get their passport stamped. After completing their itinerary, a refreshing treat will be provided to celebrate their travels. Participation is completely free for children under 16 years of age. 2018 = Bigger, Better & Cooler! 2017 was our first year, and we learned a lot. For 2018, everything related to the “experience” will be enhanced. This includes more artists (36% more, to be exact), an extra day of activities, and a completely new set-up/site plan with larger (and more) tents, providing shade for both vendors and shoppers and keeping people cool! Don’t miss this one-of-a-kind experience full of culture, art, philanthropy, shopping, and entertainment, all-in-one! Tickets are for sale online now for only $10, or you can buy them at-the-door for $15.